Welcome to What’s Next, a Sunday newsletter from the folks who deliver your essential weekday What’s News briefing. We won’t overload you: just a quick look at the week ahead and great stories you ought not to miss. The work week is coming. Be ready. Investors' confidence grows. A number of stock-market indicators show momentum accelerating ahead of earnings season, a boost to major indexes as they approach last year’s all-time highs. Earnings kick off. Investors will be monitoring the start of earnings season, which begins in earnest with JPMorgan and Wells Fargo. Other big names on the docket include the struggling Sears, the newly public Levi Strauss and Delta Air Lines. Tariffs to be the talk of economic meetings. The World Bank and International Monetary Fund hold their annual meetings in Washington, with economic officials anxious about the prospects for global growth amid trade tensions between the U.S. and many of its partners, including Mexico, Canada, the European Union and—at the top of many minds right now—China. Herman Cain expects ‘cumbersome’ scrutiny. The president’s latest choice for the Fed board expressed caution about his chances of getting a formal nomination in a video. Mr. Cain was referring to the sexual-harassment accusations—which he denied at the time—that caused him to drop his presidential campaign in late 2011. Israeli election seen as a referendum on Netanyahu. Prime Minister Benjamin Netanyahu’s quest for a fifth term rests on whether Israelis have had enough of him after two decades and a string of corruption claims. Most final polls show a fluid situation ahead of Tuesday’s vote, with the main challenger, former military chief Gen. Benny Gantz, drawing slightly more seats. Netanyahu vows to extend Israeli sovereignty over West Bank. Mr. Netanyahu said he was contemplating moves that would upend decades of Israel’s policy and test President Trump’s push for peace. Deputy attorney general pick faces lawmakers. Jeffrey Rosen, President Trump’s pick to be the next deputy attorney general, faces a confirmation hearing Wednesday. He has never worked at the Justice Department, the first time in more than 20 years that someone without prior experience has been tapped to be its second-in-command. DOJ faces pressure over Mueller report. The Justice Department is under extraordinary pressure from Congress and the public for a fuller account of what Robert Mueller found during his 22-month probe. NCAA to crown the mens' champion. 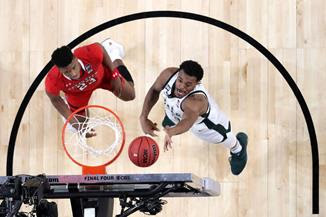 Texas Tech and Virginia will play for the men’s basketball title Monday after the Red Raiders beat Michigan State and the Cavaliers survived Auburn. The battle for the last unconquered screen—in your car. The average American spends 51 minutes a day in the car. 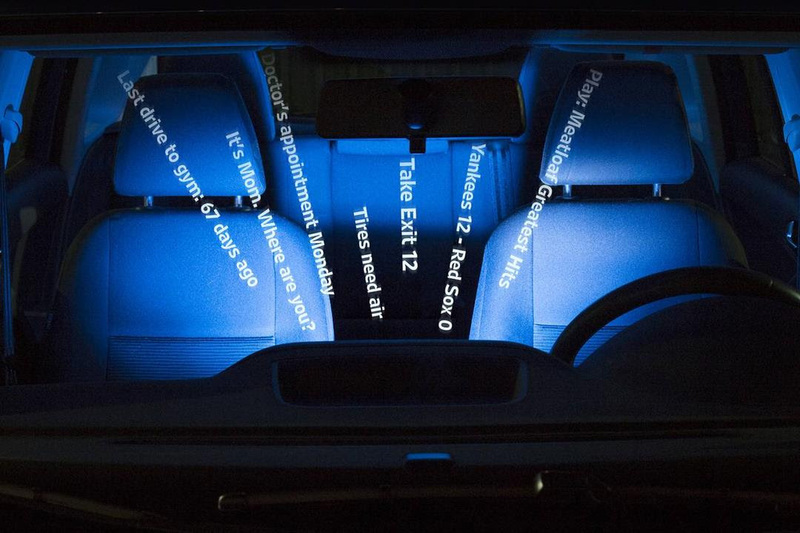 Auto makers and Silicon Valley giants are fighting for that captive audience. Does the road belong to Apple, Amazon and Google, or Ford, BMW and Toyota? You can lead a horse—but don’t try to boss it around. Behavior that’s often perceived as “strong leadership” in business becomes useless in a pasture. A barnyard workshop, a blown race and one stubborn mutt challenge the notion you’ve got to show animals—or people—who’s top dog. Equality for women must start at home. Unpaid work is the often invisible labor that keeps households running, writes Melinda Gates, who describes her own “crisis of self” in the early years of her marriage to Bill Gates and how women are climbing toward equal partnerships. What's the best temperature to drink beer? 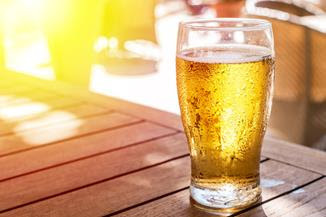 Americans are at times teased for preferring less-flavorful beer that is served near freezing, while Britons and Irish people are thought to like fuller brews poured warm. We asked two beer experts to share their tips. The secret trust scores companies use to judge us. In the world of online transactions, our apps and services are tracking our behavior to measure how trustworthy we are. But good luck finding out how you score. The deep rot exposed by the Biden flap. The problem isn’t too much hugging but the rancor and triviality of our political debate, writes Gerard Baker. Pundits, media companies and politicians have discovered that it is emotion, not reason, that wins votes and pulls in eyeballs. The machines that will read your mind. 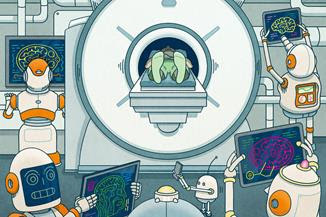 Ever more sophisticated brain scans are combining with artificial intelligence to produce tools that can track thoughts, detect lies and, someday perhaps, download our very selves. 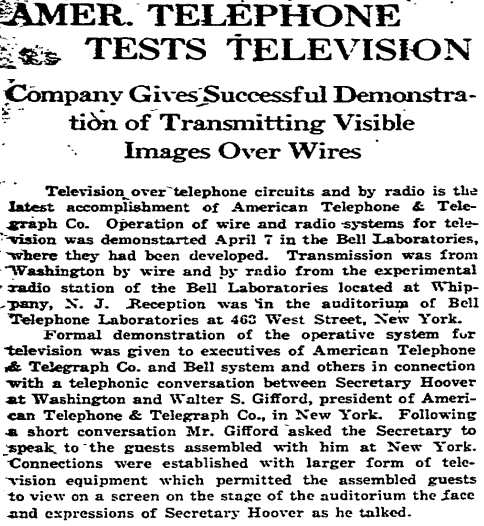 AT&T gave the first public demonstration of a long-distance television transmission in the Bell Telephone Laboratories in New York City. An image of Secretary of Commerce Herbert Hoover was sent from Washington, D.C., to New York by phone lines, while his voice came through speakers discussing the new invention. Labels: What's Next Sunday, WSJ.